Similarly cafetero is coffee farmer - and my life is made better by both! I was reminded of this term this great interview of a cafetero leader in the inspiring Dignidad Agropecuaria Colombiana (Colombian Agricultural Dignity) movement. If you want to read something inspiring about Colombia, I recommend it. 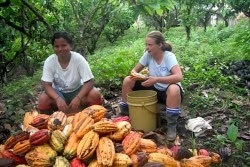 The photo here is of the process of picking out the fruit pods of cacao fruit in the most inspiring community of cacaoteros I know: the peace community of San José de Apartado. Last weekend they commemorated 10 years of the massacre of Luis Eduardo, his family, and another family. Luis Eduardo had spoken at the vigil to close the US Army's School of the Americas just two years before. They are able to continue being a neutral zone and ask all men with guns to stay out thanks in part to their international accompaniers, one of whom is pictured here. You can support the community by signing up for email action alerts from peace presence and/or peace brigades.